Around this time last year, I sowed the seeds of various flava varieties in a seedling pot and left it over the winter. In the spring the plants germinated as expected however they were always rather slow. A year on now, the pitchers are still only maybe an inch tall on all the varieties so there must have been various things they didn't like so much for the larger growth I have seen on other images over a year. I want them to survive the winter as best as possible however am unsure how to keep them alive. I currently have them in my unheated conservatory to keep the frost off them and I have been giving them just enough water to keep the peat moss moist. Just before spring I do intend on repotting them to try and help them grow a bit better next year but they've got to survive that long first! Any ideas on what I can do to help them along? Also, does anyone have any idea why they may have not grown as well as I expected over this past year? Are they really S. flava? They don't look like it to me. In the spring, I would experiment with some of them by spraying weak fertiliser over them and see how they react. Or if I could provide bright light and warmth all through winter, I would try it starting from now. I just leave my seedlings in an unheated greenhouse over winter and most survive. The things Karsty suggests will help them grow faster, but you really only want strong plants so don't molly-coddle them too much - let nature take its course and eliminate the weakest. Thanks Karsty. Yes they are Flava, surprising isn't it. Bought two different cultivars in seeds from triffid nurseries. I just thought they'd be a bit larger from a year of growth. Thanks Karsty. Yes they are Flava, surprising isn't it. I guess, thinking about it, you must have a very red cv. of flava? I had a chance seedling of S. purpurea ssp. purpurea appear in an outdoor bog garden, and after 1 year it's size was comparable to yours. they are fine,they can stand a surprising amount of frost without any ill effects. They are also very slow growing from seed,so there is nothing wrong with them size wise. 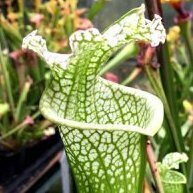 They are in sphagnum which has nothing at all nutrient wise to make them grow better,repot them into peat/perlite and you will see a real growth spurt in the spring and one last thing most sarracenia seedlings look the same in the first year anyway no matter what species they are. think Ada has sorted the expectation bit but just to second they are slow and from the 50 odd lots in the ploy they all look the same(ish). They look good :) As said repot in the spring, if you like to see things a bit quicker for whatever reason force with much light and some nutrients as per threads on forums. Mine are outside and happy, time to acclimatise if you have the space? I have read about (and seen) the cold way and have gone for that, I have read about the lights on and no over winter way but a halfway house sounds new. I will find my thread or post a photo here soon of mine but they look similar just starting to die back now. Okay thanks a lot for all your help and reassurance. I will repot them in the spring in a peat/perlite mix and hopefully that'll give them a bit of a boost for next year's growing. I think I was a bit obsessed over other people's growth I have seen over the first year where they can get much larger plants but they obviously know exactly how to get that sort of growth in the first year by force. They look perfectly normal to me for yearling flavas. They tend to jump up in size after their first few dormancy periods, so your first pitchers in spring may well be twice the size.